As Kosovo’s LGBTQ+ community prepares to celebrate its second Pride parade on Wednesday, organizer of the parade, Blert Morina, describes balancing the scales between activism and celebration. 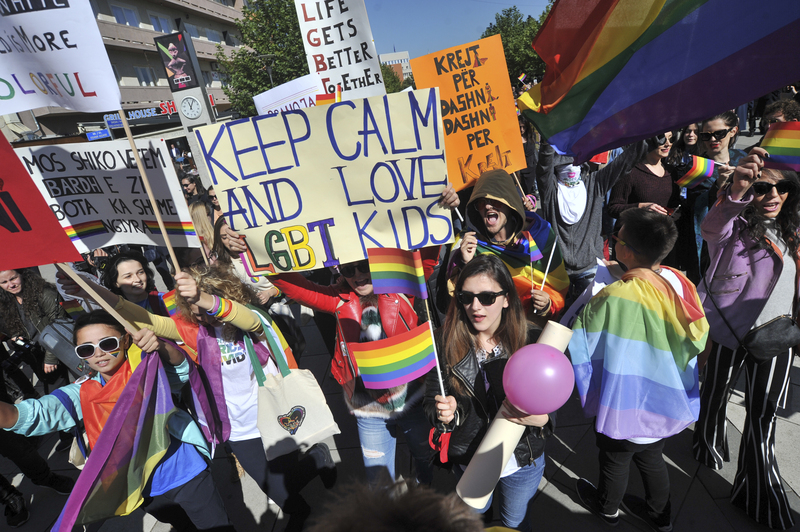 Last year, it was under the banner ‘In the name of love’ that Kosovo’s first LGBTQ+ pride parade made its way down the main boulevard in Prishtina. It was the first time that joy, music, rainbow flags and dancing accompanied marchers demanding respect and dignity for the LGBTQ+ community. However, ‘In the name of freedom,’ this year’s accompanying slogan, may ring slightly different in your ears. Blert Morina from the Center for Equality and Liberty of the LGBT Community in Kosovo, CEL, explained that ‘In the name of freedom’ looks not just for respect, but asks that people reflect on their personal prejudices. Morina is the director of CEL, one of only two NGOs in Kosovo working to promote and progress LGBTQ+ rights. He explained that despite the success of last year’s Pride, the LGBTQ+ community is a long way from achieving equality in schools, in the courtroom, in parliament, in the home, or even anywhere outside the capital city. Blert Morina walks in the 2017 Pride Parade. Image: Atdhe Mulla. Whether pride has been celebrated in a country for two years or 20, LGBTQ+ parades represent a positive and inclusive blend of activism, protest and celebration. The ability to wave the rainbow flag is a nod to the progress achieved, while also creating a platform for individuals to demand safe spaces for self-expression and identity. Morina believes that there is an imbalance in the way that organizations and civil society view LGBTQ+ rights in Kosovo, however, which can contribute to the isolation of the movement. The Pride parade is an opportunity to target these institutions and offer them a platform too to express their solidarity. Pride in Kosovo aims to draw attention to a number of intersecting issues that the LGBTQ+ community face, said Morina. Throughout the last year, CEL has been campaigning for name and gender change rights for transgender people, against domestic violence against the LGBTQ+ community and has been trying to educate young people in communities across Kosovo about equality and human rights. Now is the time these subjects should be brought together and addressed, according to Morina. “We’re going to have a lot of discussion and attention from media institutions and civil society surrounding us this week, so this is a good time to raise all of these issues,” he said. Pride Parade 2017. Image: Atdhe Mulla. 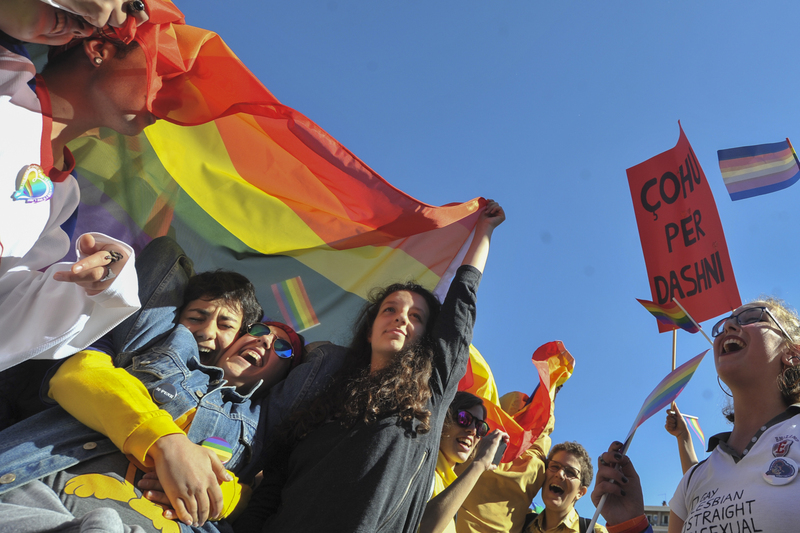 In February this year, the Center for Social Group Development, CSGD, released a report highlighting the problems that remain in Kosovo’s legal framework and media and social perceptions of the LGBTQ community in Kosovo. While the Kosovo Constitution specifically prohibits discrimination on the basis of gender identity and sexual orientation, in a working group proposing changes to the Kosovo Criminal Code, CSDG’s recommendation to amend article 147 defining hate crimes to explicitly include these social groups was rejected. On the other hand, CSDG’s recommendation to amend sentencing laws was ratified, meaning that if a perpetrator specifically targets a person because of their affiliation with the LGBTQ+ community, this could result in a heavier punishment by the court. Although it inevitably makes for slow progress, Kosovo’s first Pride was a relative success, according to Morina. Comparing it to the first pride parades elsewhere in the Balkans, it ran smoothly in Prishtina, and despite constant apprehension during the parade itself, the organizers were overwhelmed with the number of people who came to support the movement. “We received a lot of threats before the parade and they were reported in the media, so we thought that this was going to affect people showing up. It was a good feeling, and we were happy, because you look at how the first pride usually goes in the region, it doesn’t go very well, if we compare it to Belgrade or Budva, this went really well,” Morina said. Pride week this year has expanded significantly, with workshops, art exhibitions, films and panel discussions being held in the five days running up to the parade. But according to Morina, the parade itself remains the most important event of the week, exposing people who would otherwise not be aware of the event to their message. Many cities in the world support pride with cartoon-like exuberance, rainbow flags adorning every square inch of buildings, streets, people and pets in the days before and after the event. Kosovo’s Pride organizers are taking a few precautionary measures this year, however, and the celebrations may need to be a little less colorful. Two attacks following the parade last October against individuals carrying the rainbow flags, associating them with the parade, spurred Morina and CEL to issue a warning prior to the march on Wednesday. Morina explained that keeping people safe will always be more important than waving the flag, and that often means accepting that those whose liberation they are marching for will not be there to see it. “In the Balkans in general, this freedom is going to take a little bit of time. With the fact that many people still cannot attend because they’re not open or they’re too scared, of course it’s gonna take time before we celebrate,” said Morina. Morina emphasized how important it has been for high-level politicians to express their support for the parade, and that it can give more credible visibility to the LGBTQ+ community. But the reception of Kosovo President Hashim Thaci’s appearance before the parade last year was darker than anticipated, according to Morina. In a press conference on Tuesday, political party Fjala rejected the initiative to hold the Pride parade, citing the extremist views of the LGBTQ+ community and their aim to destroy the Albanian family as justification for removing the Pride parade from public space. 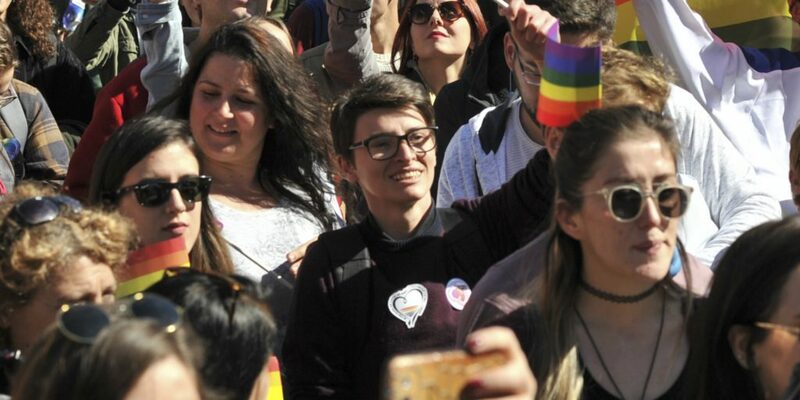 Before last year’s parade, the head of the party, Gezim Kelmendi, had his Facebook post removed after writing a status deemed to be homophobic and against Facebook’s community standards in protest of the parade. Although CSDG’s report indicated that negative perceptions of the LGBTQ+ community in the media dwindled in 2017, the public opinion expressed in the media accurately reflects the lack of support the LGBTQ+ community has across the country, according to Morina. Reaching outside the boundaries of Prishtina is still a problem, and Morina acknowledged that the atmosphere of tolerance doesn’t go far beyond the city walls. Reaching outside the capital continues to be a struggle, both for Pride and CEL, said Morina. Despite trying to hold educational programs in cities selected due to their potential to accept progressive views, he recalled threats directed towards students and CEL by teachers, telling them not to attend. Morina says that sometimes, resorting to diversionary tactics is the only way to get the message across. According to Morina, this is not going to change if the education system and the way students are taught does not change.